The development of Windows 7 takes a huge jump albeit is kind of bizarre turn of event. According to WZor.net, Microsoft apparently forked or branched out into directions on May 29, 2009. One continues to be the main branch, winmain, which has its build version jumps from 6.1.7141.0.winmain.090528-xxxx to 6.1.7225.0.winmain.090529-1930 . On the other hand, Microsoft has also prepared an Internal Developer Release (IDX) Client (for Windows 7) and Server (for Windows Server 2008 R2) builds with series starting 6.1.7200.0.winmain_win7ids.090529-205x or 6.1.7200.0.winmain_win7ids.090530-070x, to help with final pre-deployment testing. IDX Server and Client builds are distributed to TAP and OEM customers via Connect. To make matter worse, both winmain and winmain_win7ids trees are branched out for development of SP1 (Service Pack 1) too, which is said to be said on the code of Windows 7 RC. This would means that Microsoft has freezing features addition or modification on development of Windows 7, and anything extras will be brought by the SP. Nonetheless, SP development makes additional two new build series available – winmain_sp (6.1.7141.0.winmain_sp.090528-xxxx which jumps to 6.1.7225.0.winmain_sp.090529-2022) and winmain_win7ids_sp (6.1.7141.0.winmain_win7ids_sp.090528-2045 which jumps to 6.1.7200.0.winmain_win7ids_sp.090529-2355). Apparently, on the IDX branch, only Client SP is prepared although the Service Pack should work on both Windows 7 and Windows Server 2008 in a way similar to Windows Server 2008 and Vista SP2. IDX Client SP is released to TechBeta participants via WU in a CAB file. Apparently some developers have access to IDX Client and Server builds with SP1 integrated or slipstreamed too, as shown in the leak of Windows 7 Build 7201 RC2 with SP1. The IDX Client and Server builds milestone have been rumored to be the RC2 (Release Candidate 2). 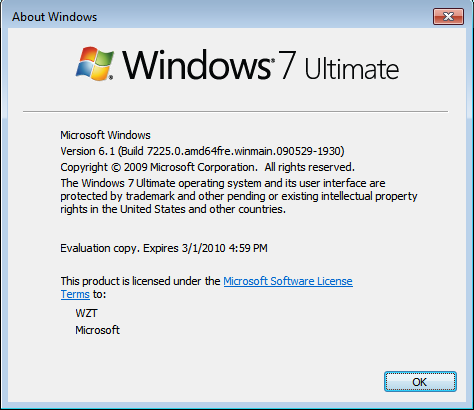 There are speculation that Windows 7 RC2 will be build 7200, and Windows 7 RTM will be build 7300. In fact, it is, kind of, except that it’s supposedly only for internal testing. Microsoft has stated that only one Release Candidate (i.e. 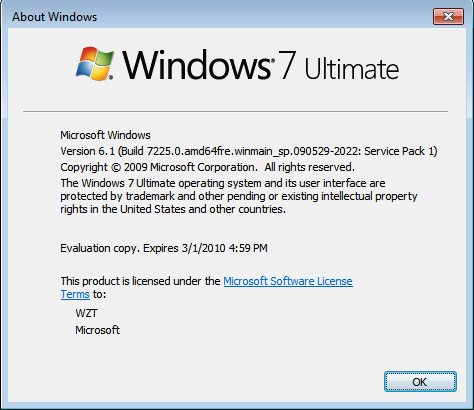 official Windows 7 RC) is available publicly. And, there will be of course a lot of SP 2, in fact. Technically, any builds that are compiled, signed and dropped after Windows 7 RC build 7100 can be said as RC2, or more accurately pre-RTM. More interestingly is which build will be the RTM-Escrow, likely to be last major milestone before the Windows 7 RTM. Microsoft is scheduled to finalize Windows 7 RTM by end of July, and will be available to consumer in OEM system and retail stores on October 2009.